The dog(s) pictured below are urgently needing help. This meaning that they usually have less than a month. Here is our (Second Chance Animal Rescue of NM) latest and greatest rescue endeavor. Meet Pete! 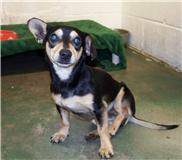 He is a one-year-old chi/doxy mix that was spotted running around Valencia county about 10 days ago. Five days ago he was picked up by animal control, unable to use his back legs - he had been hit by a car. On Friday, he was scheduled to die, but the loving volunteers of Quixote Humane put out several pleas to save his life. After seeing his sweet face, we could not say no and one of our volunteers picked him up Friday morning. So in keeping par with the type of rescues SCAR seems to continue to find (or perhaps they find us), we are now faced with approximately $4500 in vet bills as he has 5 fractures and both of his legs are broken. I was asked the other day, “why don’t you just put him down?” I didn’t have a good answer. On paper, it does not make sense. When you meet Pete, and see his quiet strength, courage, and absolute humbleness, it makes perfect sense. So much sense that the vet and his technicians are performing the first of 3 surgeries today, 1-23, on their day off. I don’t understand it myself, I just know that the powers that be, God, Love, The Universe, decided that Pete is worth saving, and he would get his miracle. And we have tasked, and blessed, to be a part of it. So, once again I am pleading with you for your support and donations - paypal donations can be made on line. **2/1 Update**: Pete came home from the hospital on Friday and is being taken care of by his foster mom! He is still facing several weeks of physical therapy and several people have expressed interest in adopting him once he's recovered. People have been so wonderful and generous and we have received $3000 of the $5600 vet bill. Please email us at secondchancenm@yahoo.com if you would like to donate OR mail a donation to Second Chance Animal Rescue, Inc., P.O. Box 15194, Rio Rancho, NM 87174.